Twang are a rock band from Turin, Italy, formed between 2015 and 2016. Bartolomeo Audisio (guitar, flute) and Simone Bevacqua (voice, guitar) are school-mates and old time friends. Moreno Bevacqua (basso e voce) (voice, bass guitar) is Simone’s brother, and both of them come from the band called 9000dol. They grown up in the House of Rock led by Roberto Bovolenta, which is a flagship for lots of young musicians in Turin. Bart comes from a classical music training (in 2015 he graduated with honors from Giuseppe Verdi Conservatory) , but he have always had a passion in Rock and blues. So, during a Blues Brothers live set in Turin, Bartolomeo and the two brothers agreed to start a new band, which will completely form just after a few months: when the drummer Luca Di Nunno and the guitarist Federico Mao joined the project, Twang were finally born. Luca (who attended the art school with Simone and Bartolomeo) was taught to play drums by the father; Federico was another young musician coming from the “House Of Rock”. The intention was clear: creating rock composition along with Italian lyrics, and playing on every stage possible. Their live debut is in 2016, the 11th of March, on the Cavallerizza Reale stage, at the Unifestival; the band immediately received a warm reaction from the audience. 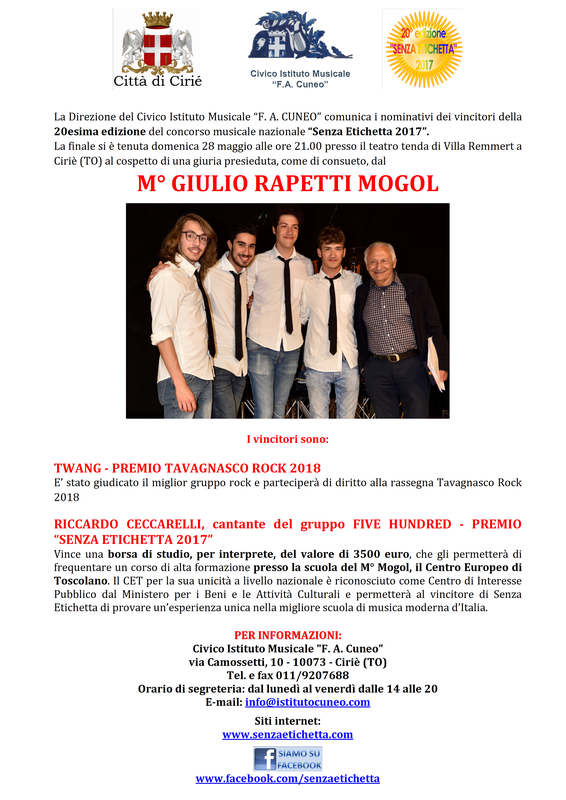 Despite the embryonic and not very mature repertoire, on May 2016 they conquered the second place, at the musical contest “Pagella Non Solo Rock”. In the following months, Twang kept on playing on various stages; they also reached the Radio Ohm Stage of the national festival “Balla Coi Cinghiali”. Then, the band started up a series of home-made recording sessions that would become the first EP. Beetwen the late 2016 and the first 2017, Twang members had to limit live sets due to their individual job and school commitments, but they never stopped writing and composing. In the meantime, Simone Bevacqua was working on the mix of the four songs recorded during Summer sessions. The mastering process of the final mixes of “Nulla si può controllare” has been assigned to Simone Lampedone. In May 2017, they won the “Best Rock Band” award at the national contest “Senza Etichetta”, with their song “La legge del più forte”. The jury was led by the songwriter Mogol. The 12th of June 2017, the videoclip of the single “Neanche un colpo” was published on Youtube. The first EP “Nulla si può controllare” was released on the 30th of June 2017.